Two New Albums Released Today! I’ve got two albums coming out today! They’re being released in different ways, and the releases are connected, so read on to find out how to get both! First of all, the first Illuminated Loops recording is coming out. 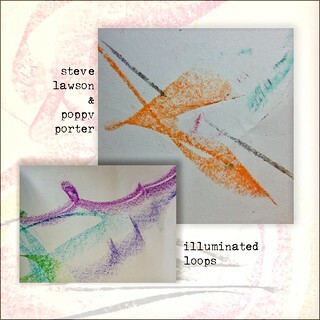 Illuminated Loops is my project with visual artist Poppy Porter. Poppy is synaesthetic, which means she ‘sees’ sound. So for this, I improvise, she draws what she sees and I then treat the drawings as a graphic score. It results in a lot of truly beautiful art and some really surprising and lovely music – it’s very much recognisably me, but definitely draws me in new directions and inspires choices that I wouldn’t have made had I just been focused on playing… There’s an awful lot more to be said about the process, which is why the album comes with extensive PDF sleeve notes. Now, the album will only initially be available to my Bandcamp subscribers. They are the people who pay £20 a year (or more, some of them voluntarily contribute over that) to get everything that I release in the year. They are the reason I’m able to make music the way I do. Last year I put out 7 albums. Some of them were subscriber-exclusives, all of them were released to subscribers a month or so before they became public. And when you first subscribe, you get a massive windfall from my back catalogue – over 30 albums, including every solo album I’ve ever made and a load of subscriber exclusive collaborations too. There are albums in there with Michael Manring, Jem Godfrey, Bryan Corbett and others that are unavailable elsewhere. It’s a crazy bargain, and if you decide to join them today, you’ll get all that music right now, and at some point today, you’ll get the Illuminated Loops album. What you’ll also get, if you sign up before tomorrow, is Over Time – a duo live album by me and drum legend Andy Edwards. Andy and I have been playing together for about 5 years now, and have a rhythm section connection unlike any other I’ve ever experienced. He’s an extraordinary musician and a source of huge inspiration. 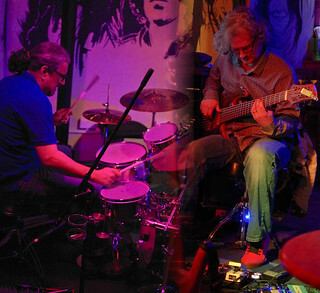 Over Time was recorded at a duo gig in Birmingham in April. It’s been available to current subscribers for just over a month, and today it goes live to the public to buy independently of the subscription. But it will also be removed from the subscriber back catalogue. To get these new albums, you have to be subscribed during the month in which they are subscriber exclusives. Stay subscribed, you get everything. Leave it a few months and you miss out on the new stuff. So, subscribe today, get Illuminated Loops AND Over Time AND the 30+ existing subscriber albums AND everything I release in the next 12 months. All for £20. None of this music will ever be on Spotify, Amazon, Deezer, Tidal, Pandora… There’s nothing in those models that makes any economic sense for an artist as niche as me. I neither want nor have the resources to pursue an audience of sufficient size for the those streaming sites to be a viable outlet for my music. The numbers just don’t stack up in any way at all. So, if you want the music, and if you want to be a part of me being able to continue to create the music, to host all the other musicians I do shows and recordings with, to keep exploring what is possible for an improvising musician in the 21st century, then the Bandcamp subscription is Plan A. And there is no Plan B. And if you’re already subscribed? Thank you. Thank you. Thank you. Again, thank you. I couldn’t do this without you. If you’ve subscribed before but have let it lapse or canceled it. Thank you too. Thanks for taking the time to investigate the music. I hope in time, you find it useful to you to resubscribe and find out what’s been going on with the music in between, but I’m hugely grateful that you took a year to investigate what I’m up to and I hope the music you bought continues to bring you joy.